The database contains more than 10,000 items, and more are added each day. You can read them chronologically, by topic, or randomly, using the Random Post button in the sidebar. If you’re looking for a particular item, click the magnifying glass at top right. We also produce a weekly podcast, which I host with my wife, Sharon. Each episode spotlights a quirky or forgotten episode from history and presents a lateral thinking puzzle, in which one of us has to unravel an odd situation using only yes-or-no questions. 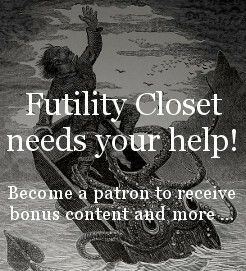 You can read Futility Closet on the web, subscribe by RSS, or sign up to receive a daily email (see Subscribe to Blog via Email in the sidebar). My name is Greg Ross. I spent 25 years as an editorial manager in science, engineering, and education publishing, most recently at IEEE, UNext.com, the National Educational Service, and American Scientist magazine. I started Futility Closet as an excuse to learn new things, and it’s grown into a full-time job. Endless prospecting. I live in the Research Triangle of North Carolina, and I mine the libraries of Duke University, the University of North Carolina at Chapel Hill, and North Carolina State University. And readers send me tips. All this goes into a big database that I comb daily for story ideas, striving for maximum interest and variety. How can I learn more about a particular item? I keep notes on my sources for each post — if you’d like to know more, you can always write to me. For artwork, wherever possible I provide a link to each source in the alt field of the image metadata. The most common exceptions are math and chess diagrams, which I produce myself. Where can I find more of this material? We’ve published two books so far, and we have a podcast that appears here and on Boing Boing. I also contribute (fitfully) to the New York Times’ Numberplay feature. I welcome submissions from readers, though I can’t promise to run everything I receive. If you can include some sort of supporting documentation, that’s greatly appreciated. Through Patreon, you can sign up to make a regular donation to support the website or the podcast (or both). You can choose the amount to donate, and you can change or cancel it at any time. In return we’ve created some rewards to help thank you for your support, including bonus posts and episodes, our public thanks, and access to an activity feed where you can interact with us and with other fans. Click here to learn more about supporting the website. Click here to learn more about supporting the podcast. You can also make a one-time donation via the Donate button in the sidebar. By some hopeless miracle, has logo designer Von Glitschka created wallpaper files for iPhone, iPad, and desktops, which are free for the downloading? You can write to Greg at greg@futilitycloset.com about the website, and you can reach Sharon and Greg (and Sasha) at podcast@futilitycloset.com about the podcast. Please note that we don’t accept advertising or guest posts on the blog. Thanks!